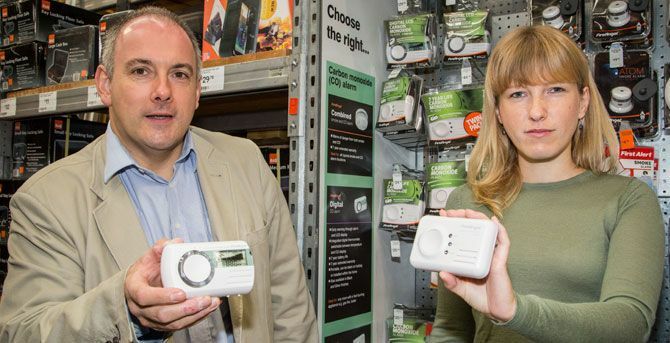 Harlow MP, Rob Halfon (pictured left), urged people to ensure they stay safe against the potentially fatal dangers of carbon monoxide (CO) as he joined local campaigner, Melissa Matthews (right) to mark the start of this year’s Gas Safety Week. Melissa is one of a group of women known as the CO Angels, who are each striving to raise more awareness about carbon monoxide poisoning after each losing someone special to this silent killer. Even exposure to low levels of the gas over a short amount of time can be lethal; causing long term damage to your health. During Gas Safety Week Melissa Matthews challenged the residents of Harlow and surrounding areas to fit an audible carbon monoxide alarm before the clocks go back. The danger is – with no taste or smell – CO is undetectable to the human senses and because symptoms are often mistaken for ailments including flu, food poisoning and even a hangover, its presence can go unnoticed until it’s too late. Badly fitted, poorly serviced or faulty gas appliances can put occupants at risk from gas leaks, fires, explosions and carbon monoxide poisoning. Worryingly CO can also leak from adjoining properties and garages. The only way to detect its presence is with an audible carbon monoxide alarm. As a smoke alarm alerts you to fire, a properly placed CO alarm detects the lowest levels early, warning you before the gas becomes life threatening so you can take action to stay safe. The fourth annual Gas Safety Week aimed to bring gas safety to the forefront of people’s minds. Dangerous gas work can kill, so it is vital that gas appliances are safety checked at least once a year. If left unchecked, poorly serviced gas appliances can cause gas leaks, fires, explosions and carbon monoxide poisoning. In the last year alone, 343 people were injured and 10 people died as a result of gas related incidents. One useful indicator that carbon monoxide may be the cause is if symptoms disappear when you leave your home and reappear when you’re at home. Get your gas appliances safety checked at least once a year and serviced in line with the manufacturer’s instructions. This includes your gas boiler, gas cooker and gas fire. Sign up at www.staygassafe.co.uk for a free reminder service. Check for warning signs your appliances aren’t working correctly, such as lazy yellow or orange flames instead of crisp blue ones, black marks on or around the appliance and too much condensation in the room. For more information or to find a Gas Safe registered engineer visit www.GasSafeRegister.co.uk or call 0800 408 5500. For more advice and information on Sprue’s complete range of carbon monoxide alarms, visit: www.fireangel.co.uk.